I could do my taxes. Instead I’m writing my blog. That tells you most everything you need to know about me. But this post isn’t about me. I’m participating in a blog discussion with TrailRunner Magazine with the subject set as, “Can trail running develop into an unhealthy addiction?” Wonder if there’s a social networking term for group blogging like this. I know, TrailRunner Mag’s question sounds rhetorical. Absolutely it can be habit forming. Seems redundant though to say unhealthy. Addictions generally carry a negative enough connotation with them rendering that adjective unnecessary. Or is it? Running by itself can be addictive. The endorphins that release into the body after 45 minutes or so generate a nice buzz for the vain, skinny, hypocritical road runners who tell you they do it for their health – in between buying inserts from the local PT dealer and scheduling their next MRI. The law hasn’t yet caught up to these junkies. Let’s be clear though, trail runners are different from road runners. We don’t sit around after our runs in a stoned stupor; our runs themselves are Henry David Thoreau inspired transcendental experiences. A road runner’s addiction is a trail runner’s discipline. If addiction represents a habit formed by incessant trail running, then certainly we are addicts. We are not fair weather runners. We fling spring mud and wander through winter whiteout conditions nearly naked in shorts. Addiction is a tool leveraged by weak minded road runners in their hope to form a healthy habit. The disciplined trail runner keeps the mind soberly focused on prepping the appropriate gear to the forecasts from their Weather Channel app. The trail runner’s romp though adverse conditions and challenging terrain is as conscious a decision every time as the sun rising in the morning and setting over the horizon at dusk. You will not find a more controlled and deliberate habit. What could be unhealthy about it? Are trail runners dazed in a foggy haze in social environs? I lived in the athletic dorm one semester in college and recall a roommate who could talk about nothing other than his workouts. I found him boring beyond belief. Vain and narcissistic people find their way in sports. There’s a reinforcing affinity between their personality and the workouts. That’s not a result of the repetitive nature of running the trail day in and day out. They’re simply self-centered. The repetition that forms the habit – that establishes the addiction – is a beautiful thing. To ask if trail running is an unhealthy habit is to suggest a healthy addiction is an option. Have you watched an elite athlete run? Up close? I was following on the heels of 20 year old Katja Broecker in last week’s Boulder Half Marathon. She passed me at 7 miles and I fell in behind her because her stride was so excellent, it sucked me in like a vortex. She was mostly airborne, her feet touched down only long enough to satisfy the gods she was human. I was behind and slightly to her right at 8 miles when she cut in front of me to grab a water at the aid station. I was ready to throw my arms up to keep from colliding with her but instead she sipped her water at full speed, tossed the cup, and the space between us never closed by even an inch. Who can do that? I can’t. That’s the exquisite form of an elite athlete and that level of skill comes only from training to the point your body has reached the level of art. I have no doubt coming down from such a high is painful. I know first hand what it feels like to be sidelined from injury. The addiction left unfed worms its way through your mind until it’s destroyed all self-confidence. Unwinding an addiction is ugly, but when it’s created beautiful art it can’t be bad. 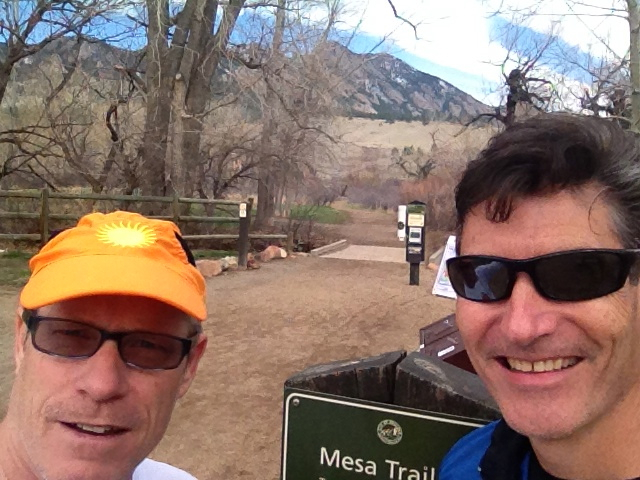 Keith and I ran the Mesa Trail today from Eldorado Canyon to Chautauqua Park in Boulder. And back. 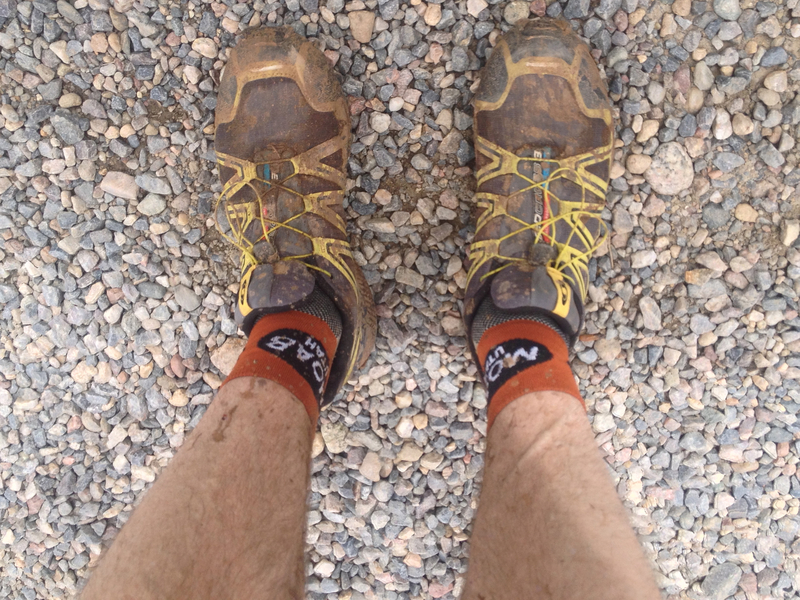 About a 13 mile trail run over steep inclines and mud. I know I’ve neglected certain things to be able to wake up early to run this trail. Maybe it was asocial of me not to be out quaffing drinks with friends. But if you ask me how I feel right now, I would not respond by saying I feel unhealthy. I’m buzzed and I can’t wait to get back out to run it again. Hey, saw you were going to to the Mesa Trail and thought about going there for a hike with my dog, but I slept in instead and we went for a nice simple 3 miler in N. Boulder. Difference between a trail runner and a couch potato. Glad I missed the mud, I know that trail and figured it would be really muddy in spots after the snow earlier in the week. It is about time to break out the vibram five fingers! I wore good-gripping trail shoes and handled the mud okay. I forgot about you wearing five fingers. I have yet to try those, I wear minimalist shoes which don’t have the toes.